Proboscis structure. 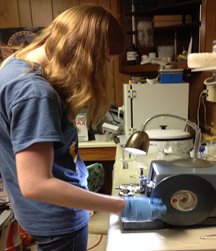 The CI team is using traditional histological activities, optical microscopy, and engineering analyses not traditionally applied in biology, to elucidate some of the poorly understood important functions of the butterfly proboscis. During its adult life, the butterfly coils and uncoils the proboscis without noticeable deformities or loss of flexibility, unlike metal springs. The proboscis is a complex biological structure of rigid and flexible components, hydrophilic and hydrophobic components, and control structures. There also are questions about how the curvature, shape, and size relate to the function of the proboscis. For example, is the cross-sectional shape of a proboscis mechanically critical to function? Some investigators have hypothesized that the shape acts like a snap spring to stabilize the coiled or straightened position. Initially the emphasis will be on the butterfly. The CI team will then work in pairs to apply the microscopic methods to other proboscis insects (e.g. house fly) to compare the structures and engineering principles shared by fluid feeding insects. Image analysis will enable engineering analyses and modeling of function. 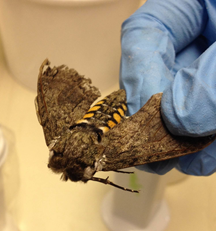 Once techniques for studying adult specimens have been developed we will attempt to analyze pupal development of the structures and some of the specific components important to fluid feeding. Butterflies and moths are beautiful insects that have scaly wings and the ability to fly. They undergo complete metamorphosis where they undergo four different life stages: egg, larva, pupa, and adult. The Creative Inquiry team raised Painted Lady caterpillars in addition to Manduca sexta, observing their transformation into adults. 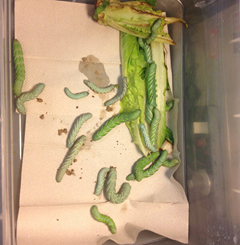 Figures 1 and 2: These pictures illustrate larvae (left) and an adult (right) of Manduca sexta. 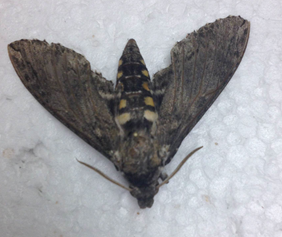 Once M. sexta adults were obtained, they were decapitated in order to observe their proboscis. A proboscis is a long, thin tube of insects such as butterflies. The proboscis unrolls when the insect is thirsty and senses food, and coils again when it is not being used. The cuticle of the proboscis putatively contains a protein called resilin, which enables the proboscis to spring back into its coil when it has finished feeding. Contraction of muscles extend the proboscis while relaxation allows the proboscis to curl as the resilin springs back into its resting state. Figure 3: The heads of M. sexta were removed for proboscis analysis. The decapitated heads were submerged in Bouin’s solution, an excellent fixative for preserving delicate structures, and placed in a vacuum to enhance rapid infiltration. With different trials, the solution was cleared with xylene, resin, or a combination of resin (L.R. White) and glycerol. 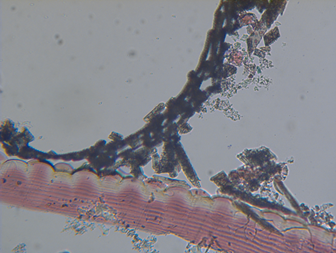 The specimens cleared with xylene were substituted with embedding wax, ultimately provided support for sectioning. 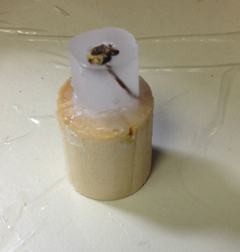 Those in resin were not embedded in wax but rather placed on a wooden block to be sectioned. 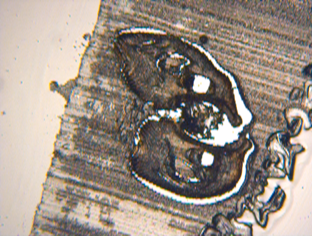 The specimens, whether cleared with xylene or resin, were sectioned using an 820 Spencer microtome and observed under a light microscope. A variety of stains were used, including Methyl Green, Trichrome Stain, Hematoxylin, Bismark Brown, Carmine Alum, and Crystal Violet. Figures 4 and 5: A microtome was used to produce segments of the Manduca specimen. Several specimens were segmented successfully where proboscis structure was noted when analyzing these segments under a light microscope. Figure 6: This is the cross-section of an M. sexta the group obtained. The large white hole in the middle is the tube that food goes through. The two smaller holes on either side are for breathing. Figure 7: The bumps on the outside of proboscis are hydrophilic and enable the insect to obtain food. The group hopes to further their analysis of proboscises in other insects such as the black fly. Black flies, as opposed to the beautiful and peaceful butterflies, are not an insect you would want to spend time around. These dark flies give a painful bite and are often carriers of the filarial disease Onchocerciasis, commonly referred to as River Blindness. They utilize blood feeding similar to a mosquito; however black flies slash the skin rather than piercing the skin. When feeding, the female black fly anchors its proboscis to the host by small hooks. The mandibles cut into the skin with rapid scissor-like movements. In analyzing the proboscis of black flies, using the same procedure, the group can compare it to that of the Manduca.